I just returned from a trip to Svalbard, which is an island group in the Arctic Ocean about 1000 km from the geographic North Pole. I was asked to guest lecture and help teach a part of a sedimentary geology field course. We never actually made it to a couple planned field sites because of bad weather during the trip combined with general snow/ice conditions from the winter and spring. Oh well … these things happen in a scientific discipline that requires going to the field. Fortunately, the backup plans for other geological things to see and do were fantastic so I don’t think the quality of the class suffered. Svalbard is located from 74°N to 81°N and was my first time above the Arctic Circle (~66°N). Here is a very nice polar projection topographic/bathymetric map with location of Svalbard annotated by me. Although I was fully expecting and prepared for 24 hours of sunlight, it was still an interesting experience. Took a few nights to get used to … I kept waking up in middle of the “night” thinking I had overslept and was late for the day’s activities. Being in the field makes you very aware of the patterns of the sun throughout a day, so it was also an interesting experience to have the sun mostly circling me rather than rising and setting. I’ll try and write some more about this experience soon, but in the meantime here are a few photographs with a bit of explanation (below the photo). 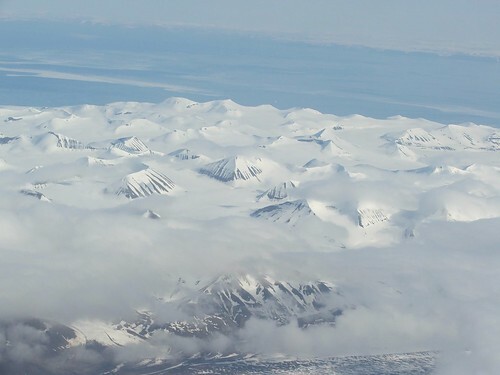 Out of the window of the plane as we approached Longyearbyen, Svalbard — which, by the way, is the nothernmost location on Earth one can fly to any time of year. 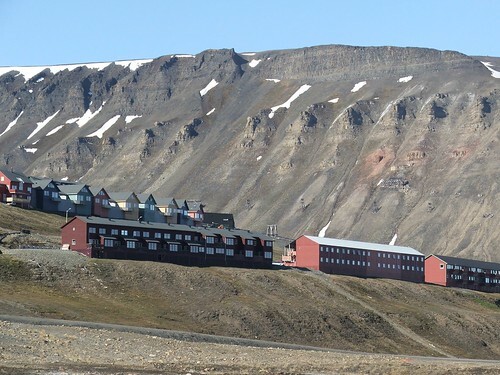 The town of Longyearbyen is the largest settlement on Svalbard (about 2,000 residents) and sits in a valley among cliffs of Eocene sedimentary rocks. There aren’t any roads that connect the few settlements on Svalbard, so traveling from one place to another requires either boats or planes. To get to some particular outcrops we took an 18-minute flight in a small plane that shuttles workers from Longyearbyen to an active coal-mining settlement. 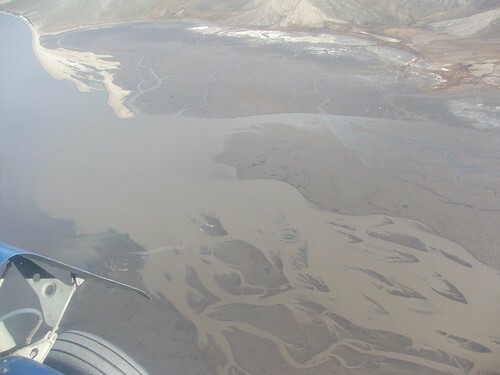 Although short, this flight provided an opportunity to get a bird’s-eye view of the spectacular glacial-outwash sediment dispersal systems in the region. The photo above shows this beautiful plume of sediment from a braid-delta system. 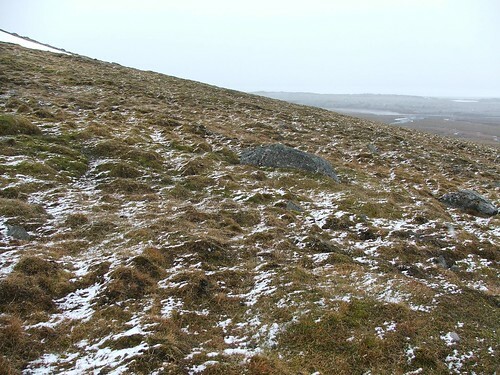 A dusting of snow on the squishy and very muddy tundra. In terms of flora, this low mossy grass and several species of small wildflowers are about it. 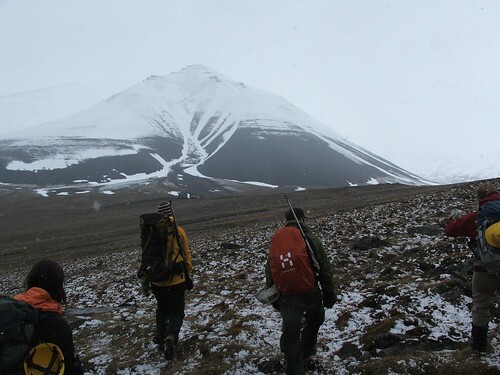 Field work in Svalbard requires carrying (and being trained to use) hunting rifles in case of polar bear encounters. Over 15 or so years and many thousands of researchers doing field work, only one bear has been shot and killed (apparently by polar bear researchers). I have very little experience with guns and was pleasantly suprised at the multiple bullseyes I got during training. 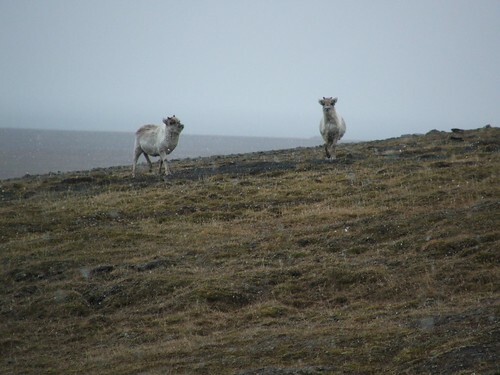 On the way back from a hike (on which Mother Nature conquered me … yet again) a couple of juvenile reindeer followed us for a bit. The outcrops near the coal-mining settlement still have some equipment and structures from old-time installations. The rocks above the coal level are a mixture of coastal plain with increasingly more marine influence upwards. Near the toe of the Hoganasbreen glacier in the evening. 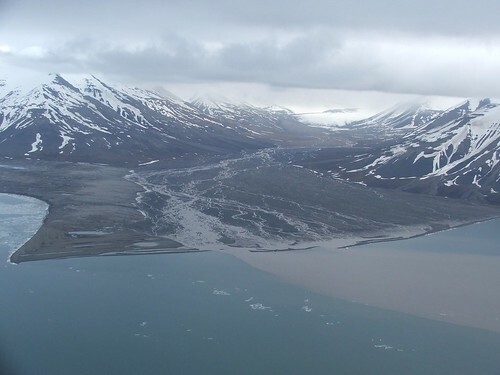 Our short flight back to Longyearbyen provided another opportunity to get some photos of the sediment dispersal systems. It was a bit of a hazy day so the photos aren’t very crisp, but still show the features nicely. 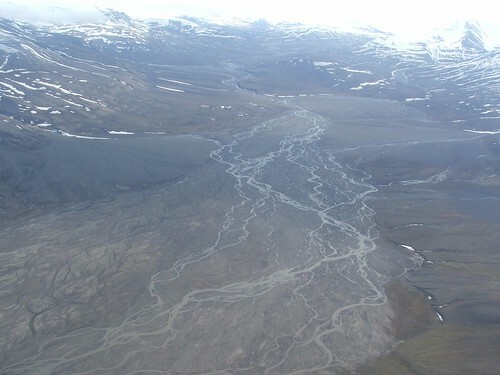 Alluvial fan developing in the Adventdalen valley near Longyearbyen. The mouth of the Adventdalen River is somewhat influenced by tidal currents in the fjord giving it this distinctive pattern. 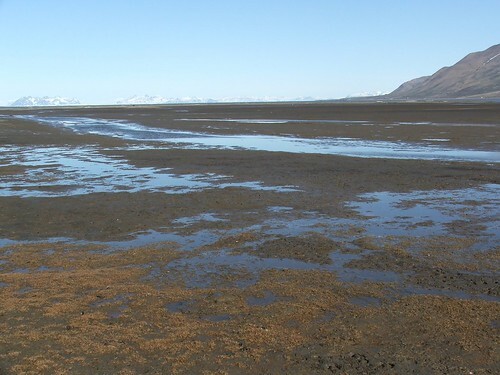 The muddy tidal flat near the mouth of the Adventdalen River. Here is that same alluvial fan — now from the ground. Finally, just before we left the field on my last day we were hiking back to where our vehicle was and spotted the summer training program for the sled dogs. To see these photos (and more) at higher resolution, check out my Flickr set here. This was a great trip … I feel fortunate to have been able to go. I met some really great people that I hope to collaborate with in the future as well. Beautiful pictures. Now, if I understand the plate framework right, Svalbard was once the north end of Greenland? These are gorgeous photos. I can’t wait to hear more about the trip. Andrew … yes, that is my understanding … as the Atlantic opened further south there was some transpression in western Svalbard that created an orogenic belt (and associated foreland-type basin) … and subsequently the rifting separated the two. Probably more complex than that, but I think that’s the basic gist. Absolutely fascinating! Thank you for sharing the gorgeous pictures and commentary. Beautiful pictures of a braided alluvial system. I’m most intrigued by the picture of the houses in Longyearbyen showing the side of the valley. The erosion gullies appear so uniform, almost architectural. Is that normal? What are those reddish areas? Heh, it does. Last year during a field school (in archaeology), because I didn’t wear a watch or compulsively check my cell phone, I eventually picked up the ability to gauge when it was lunch time and load up time by sun height and the shadows created by the pavilion tents covering our units! These are great. 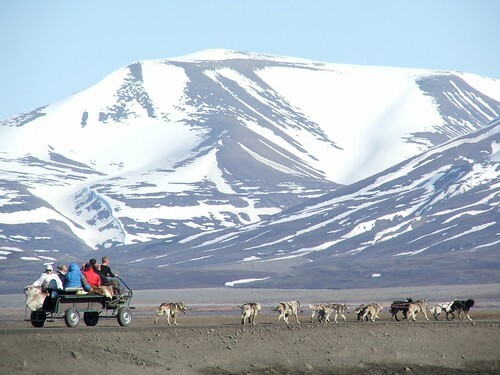 Some colleagues of mine at Northern Arizona University go up to Svalbard for Quaternary work quite frequently. It’s nice to actually see the rocks and terrain with some great photos, thanks for that. Any idea how Longyearbyen got its name? That kind of erosion is sometimes seen in mountains of flat-lying sedimentary rocks, where the layering is relatively consistent. It is quite striking in this case. The red areas are most likely scars from old coal fires (if you look closely there is some old equipment on the hillside near that red area). Thanks for all the beautiful photos. It seems like a trip one would have to enjoy. It’s clear that a geologist is the author…. 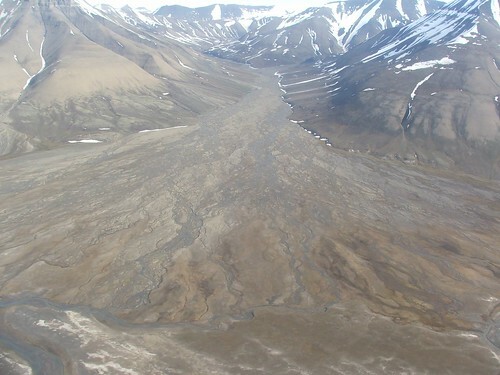 I have never seen a picture of an alluvial fan so clear…. Check out the arctic ocean in that bathimetry pic- is the mid-ocean ridge acting like a sediment trap for everything coming off the north European continental slope? Also, how is mining coal in such a remote place economic? Isn’t it icebound for half the year? I don’t know that area in detail, but could be … the Juan de Fuca Ridge does a similar thing near the Oregon-Washington continental slope. I don’t know about the economics … but, the mine doesn’t shut down completely in the winter as far as I know. I had a brief geological visit to Svalbard last month. I enjoyed it VERY much, and love your photos and descriptions. Any chance you could include it in your lists of blogs? You’ll see some of my photos from Svalbard, with much more. Mark … always good to see another geoscience blog, you are in my list and in my rss reader (which shows up in ‘Geoblogospheric Circulation’ feed on sidebar as well). I’m sure the others will add you over the coming weeks. 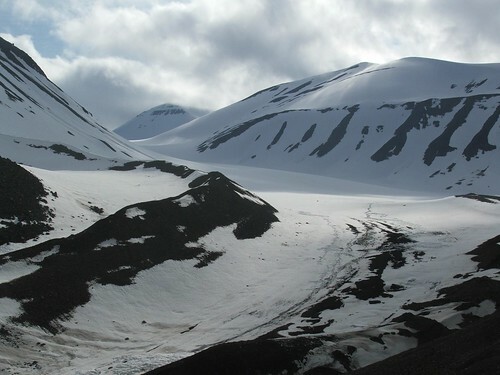 I was lucky enough to do my thesis work on Svalbard nearly 20 years ago. It is a fantastic place to do geology. I too learned to shoot a rifle and did well in target practice. However, it’s one thing to hit a stationary target and something quite different to hit a moving polar bear with adrenalin pumping through your body! Fortunately, I have never seen a polar bear while doing fieldwork neither on Svalbard nor Greenland. Regarding coal mining on Svalbard. The mining takes place year round. 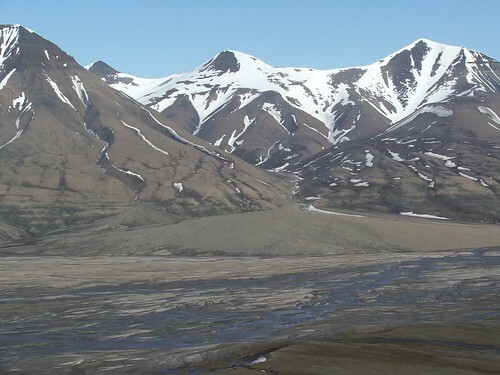 The mines are below the permafrost and keep a constant temperature of about 4 degrees C. The coal layers are more or less horizontal and fairly shallow. The coal is shipped out by boat. This takes place from June to October, depending on the ice conditions that year. The coal mining company makes good profits. One of the reasons is that the distance from the mines to the harbour is only 6km, compared to several 100’s of kms for most other large coal producers. Lisa … thanks for the comment. 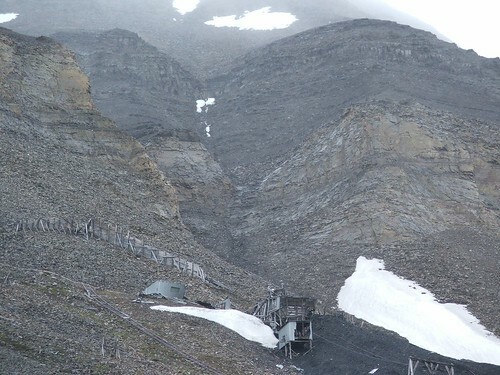 Is it true that this is the only coal mine in all of Norway? While there are several coal mines on Svalbard (the russians also mine coal on Svalbard), there are no coal mines on the norwegian mainland. I ran into your photos while scouting the web for Arctic stories and photos. It’s amazing to be sitting in my living room in Austin Texas and be able to view these amazing photos and even better, to get your scientific point of view and information. I never got stuff like this in my science class in high school or college! I am an English major and am very gratified to find that you write beautifully, which adds an extra dimension of pleasure. Rita, thanks for your kind words … this is why I post this stuff, hoping that some people find it valuable.